Professional Quality. Prevents engine corrosion during storage. 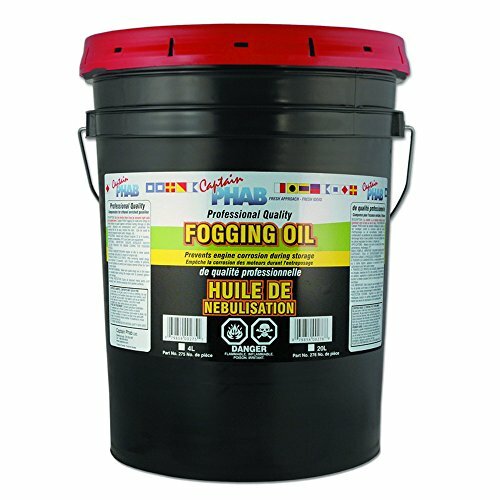 Captain PHAB Fogging Oil coats and clings to metal surfaces to guard against moisture, condensation and acidic combustion by-products that lead to corrosion during storage or idle periods. Resists fouling spark plugs for an easy, trouble free start. Can be used to protect any internal and exposed engine parts, linkages, etc. APPLICATIONS: Marine - Inboard and outboard engines (2 or 4 cycles), RV - Small engines, generators, pressure washers, Recreation - chainsaws, snowmobiles, ATVs and lawn care equipment. Prevents engine corrosion during storage. Fogging Oil coats and clings to metal surfaces to guard against moisture, condensation and acidic combustion by-products that lead to corrosion during storage or idle periods. Can be used to protect any internal and exposed engine parts, linkages, etc. Used for: Inboard and outboard engines (2 or 4 cycles), RV - Small engines, generators, pressure washers, chainsaws, snowmobiles, ATVs and lawn care equipment. If you have any questions about this product by Captain Phab, contact us by completing and submitting the form below. If you are looking for a specif part number, please include it with your message.